Battlestar Galactica is an excellent roller coaster in Sci-Fi City and one of the best attractions at Universal Studios Singapore. The minimum height to ride is 49 inches. 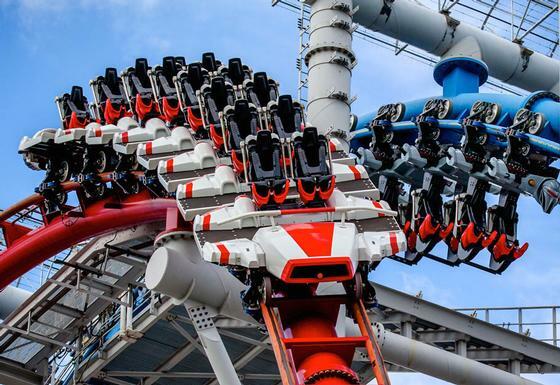 Battlestar Galactica are launched, dueling Vekoma coasters: "Human," a sit-down coaster, and "Cylon," an inverted. The ride closed at the end of July 2013 "for review" and remained closed until reopening in May 2015. It now features Viper-styled Human trains that seat two across, rather than the four-seat rows on the previous trains. Battlestar Galactica opened with the park in early 2010, only to close a week later due to what was later revealed to be cracks in the seat-post supports on the Human side. The ride remained closed for 11 months before reopening with reinforced seats on both sides. - this ride remains one of the highlights of Universal Studios Singapore. There is no Single Rider Queue for either half of this attraction, though Crew Members will regularly exercise discretion and reorder the front of the queue to allow single riders to board slightly earlier in order to fill empty single seats. Queues for the ride are divided into two separate coasters. The Human coaster is the less convoluted of the two coasters - at no point does the coaster invert, and there is a floor on the coaster cars, though in practice you'd have to dangerously close to being too tall to ride before your feet touch the flooring. There is nothing enclosing the sides though - leaving only the harness to keep you tightly in your seat. On a peak day, expect wait times of 45-90 minutes on each normal queue of this coaster for a ride that lasts two minutes at most, with queues halved severely on an Express pass to maybe 2-10 minutes. To prevent undue accidents involving loose articles inadvertently hitting other riders or passers-by, crew members regularly scan for such items and direct them to be stored in nearby free lockers with other bags. Depending on the fit of footwear and glasses, you may also be asked to temporarily deposit such items in racks near each coaster while riding.